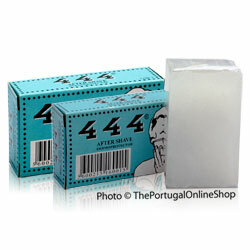 The 444 Alum Block is a mineral bar made of naturally extracted alum and potassium. The alum has hemostatic properties and stops bleeding instantly while the potassium has antiseptic and astringent properties to tone the skin and close the pores after shaving. Use this stone moistened with cold water and gently rubbed over the entire face to act as an antiseptic for razor burn. It can also help to stop bleeding of nicks and cuts. The Alum block also has antiseptic properties that not only cool and refresh the skin after shaving, but also act as a balm. Simply wet the block, apply to face, and then dry with towel. After use clean the alum block thoroughly with water, dry it and store in a dry place. If you allow the block to remain moist or exposed to moisture it will dissolve. Alum Potassium is also an astringent/styptic and antiseptic. For this reason, it can be used as a natural deodorant by inhibiting the growth of the bacteria responsible for body odor. 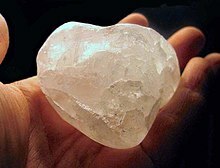 Use of mineral salts in such a fashion does not prevent perspiration. Its astringent/styptic properties are often employed after shaving and to reduce bleeding in minor cuts and abrasions, nosebleeds, and hemorrhoids. It is frequently used topically and internally in traditional systems of medicine including Ayurveda, where it is called phitkari or saurashtri, and Traditional Chinese Medicine, where it is called ming fan. It is also used as a hardener for photographic emulsions (films and papers), usually as part of the fixer, although modern materials are adequately hardened and this practice has fallen out of favor. I didn't know the product, but I love it! I also loved the vintage package. Refreshes and revitalizes the skin. Must have product. Me gusta mucho, y es el test de cada uno de mis afeitados, que me dice si ha ido bien o no tan bien. Un buen producto natural con propiedades que, cuando la piel las requiere, se agradecen; y con un precio fantàstico.